Cruise Control, DAB Digital Radio Reception, Deluxe 3 - Zone Climate Control, Rear Acoustic Parking Sensors, 17in x 75J 5 - Arm Design Alloy Wheels with 225/50 R17 Tyres and Locking Wheel Bolts-Low Rolling Resistance Tyres, Audi Concert Audio - Single CD Drive and SDHC Memory Card Reader which are Both MP3- WMA and AAC Compatible - 6, 5in Colour Centre Display with MMI Operating Logic - AUX - IN Connection, Colour Drivers Information System (DIS), Electric Front Windows, Mobile Telephone Preparation - Bluetooth Interface, Rain Sensor, Thatcham Category 1 Alarm, Upholstery - Milano Leather. 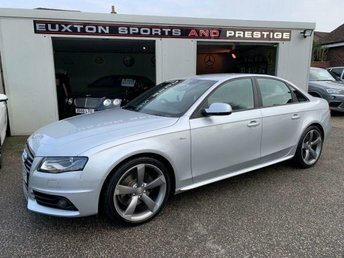 4 seats, SATELLITE NAVIGATION + BLUETOOTH + BLUETOOTH AUDIO + FULL HEATED LEATHER INTERIOR + JUKEBOX MUSIC STORAGE + FRONT AND REAR PARK ASSIST + CRUISE CONTROL + VOICE COMMAND + 4 X CONTINENTAL TYRES + 2 X KEYS. , SATELLITE NAVIGATION + BLUETOOTH + BLUETOOTH AUDIO + FULL HEATED LEATHER INTERIOR + JUKEBOX MUSIC STORAGE + FRONT AND REAR PARK ASSIST + CRUISE CONTROL + VOICE COMMAND + 4 X CONTINENTAL TYRES + 2 X KEYS.